Our new single, "Winds of Change," release date June 1, is going global through CD Baby, Amazon and iTunes. Watch this space for updates! CHECK OUT OUR LATEST CD!!!! CLICK HERE to preview the title track and click here for sound samples on CDBaby! Engineered and recorded by the great Billy Lawson (engineer at FAME, Muscle Shoals Sound, Wishbone and more) at Big Star Recording studio, we got that big fat, warm and soulful sound we were seeking! Don't hesitate - get your CD/download today from CDBaby, Amazon or iTunes. Singer, guitar player and songwriter Debbie Bond has been paying her dues in the Alabama backwoods for over 30 years. 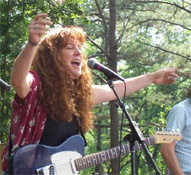 Her singing has been compared to Bonnie Raitt and Maria Muldaur, both of whom she cites as being influences on her music. The truth is that Debbie does it her way, playing a dynamic mix of soulful originals and covers. Her impressive musical story includes years of performing with older traditional Alabama blues musicians, including Johnny Shines, Eddie Kirkland and Willie King. Her immersion in the blues has deeply flavored her guitar playing, soulful voice and original song writing, yet her sound is contemporary and original, incorporating soul, blues, rock, jazz and Americana influences. This unique musical synthesis can be heard on her latest album, 2016's Enjoy The Ride. She is the co-founder and was for many years executive director of the award-winning Alabama Blues Project, an educational non-profit devoted to preserving and promoting Alabama's rich blues heritage. Check out Debbie Bond on Facebook and YouTube! February 26, Tuesday, Holly Pond, AL. In-school blues education program as part of the Alabama State Council on the Arts Touring Artist Program. March 1, Friday, Flomaton, AL. In-school blues education program as part of the Alabama State Council on the Arts Touring Artist Program. March 5, Tuesday, Abbeville, AL. In-school blues education program as part of the Alabama State Council on the Arts Touring Artist Program. March 6, Wednesday, Headland, AL. In-school blues education program as part of the Alabama State Council on the Arts Touring Artist Program. March 9, Saturday, Columbus, MS. RESCHUDELED to April 26! "Blues for Willie" - celebrating the late, great bluesman Willie King. Presented by the Columbus Arts Council at the Rosenzweig Arts Center. March 12, Tuesday, Vinemont, AL. In-school blues education program as part of the Alabama State Council on the Arts Touring Artist Program. March 13, Wednesday, Brookville, AL. In-school blues education program as part of the Alabama State Council on the Arts Touring Artist Program. March 20, Wednesday, Rockford, AL. In-school blues education program as part of the Alabama State Council on the Arts Touring Artist Program. March 23, Saturday, Tuscaloosa AL. Debbie Bond and "Radiator" Rick benefit performance for Hospice of West Alabama celebrating their 10th Annual 5K run. Music outside the hospice from 7:30 to 10:30am. (205) 523 0101. March 28, Thursday, Guntersville, AL. Debbie Bond and "Radiator" Rick at the Rock House Eatery. Music from 6-9pm. (256) 505 4699. March 29, Friday, Tuscaloosa, AL. Debbie Bond Blues Band and much more for the Alabama Blues Project's "Eveninging of Art and Blues" at the historic Drish House. April 1, Monday, Orville, AL. In-school blues education program. April 2, Tuesday, Orville, AL. In-school blues education program and community performance at the Orrville Farmers Market from 6-8pm. April 4, Thursday, Northport, AL. Debbie Bond and "Radiator" Rick at Kentuck Art Night. Music from 5-8pm. April 6, Saturday, Muscle Shoals, AL. Debbie Bond Blues Band at the excellent Champy's. Music from 7 - 10pm. April 13, Saturday, Birmingham, AL. Debbie Bond and "Radiator" Rick at Pepper Place Market. Music from 8:30am. (205) 490 3176. April 17,Wednesday, Pell City AL. Debbie Bond and "Radiator" Rick at the Pell City Public Library. Music from noon-1pm. April 18, Thursday, Tuscaloosa, AL. Debbie Bond and "Radiator" Rick at the Indigo Hotel. April 26, Friday, Columbus MS. "Blues for Willie" - celebrating the late, great bluesman Willie King. Presented by the Columbus Arts Council at the Rosenzweig Arts Center. May 9, Thursday, Guntersville AL. Debbie Bond and "Radiator" Rick at the Rock House Eatery. Music from 6-9pm. (256) 505 4699. May 11, Saturday, Tuscaloosa, AL. Debbie Bond and "Radiator" Rick at the Tuscaloosa River Market. May 18, Saturday, Bessemer AL. Debbie Bond Blues Band at the famous Gip's Place (directions here). Music from 8pm. (205) 919 8142. May 25, Sunday, Atlanta GA. Great blues venue - Debbie Bond Blues Band at the Northside Tavern. Music from 10pm-2am. (404) 874-8745. June 2, Sunday, Birmingham AL. Great, intimate listening room - Debbie Bond Blues Band at Daniel Day Gallery/Dream Mecca Studio. Music from 2-6pm. (205) 731 7420. June 8, Saturday, Birmingham, AL. Debbie Bond and "Radiator" Rick at Pepper Place Market. Music from 8:30am. (205) 490 3176. July 6, Saturday, Llandovery, UK. Castle Hotel / Llandslide. July 7, Sunday, Crawley, UK. Crawley Blues Club at The Hawth. July 13, Saturday, Billericay, UK. Blues at the Barleylands. July 14, Sunday, Stevenage, UK. Blues at the Red at the Red Lion. July 17, Wednesday, Tunbridge Wells, UK. Toad Rock Retreat. July 20, Saturday, UK. Private event. July 21, Sunday, UK. Private event. July 22, Monday, Oxford, UK. Famous Monday Blues at the Jericho Tavern. July 26, Friday, Lichfield, UK. Pokey Hole Blues Club. July 27, Saturday, London (Camden Town), UK. The Green Note. July 31, Wednesday, Northampton, UK. Malt Shovel. August 2, Friday, Marlborough, UK. Double-bill with Little Jimmy Reed at Marlborough Town Hall. August 3, Saturday, Orpington, UK.Debbie Bond and "Radiator" Rick at the Liberal Club. August 4, Sunday, London, UK. Broomfield Bandstand Blues. August 10, Saturday, Timsbury (near Bath), UK. Radford Mill Festival of Rhythm and Blues. August 16, Friday, Ventnor, UK. Ventnor Arts Centre. Tickets now available at Eventbrite! August 18, Sunday, Market Rasen, UK. Debbie Bond Blues Band at the Original Sunday Blues in the Hope Tavern. August 27 to September 4, FRANCE. Details to be confirmed. September 6,Friday, Bridgend. Working Mens Hall, Blaengarw. September 12, Thursday, Deal, Kent, UK. Spooner's Blues Club in the The Alma. September 14, Saturday, Hastings, UK. The Hastings Seafood and Wine Festival. September 15, Sunday, Stoke-on-Trent, UK. The Potteries Blues Club at the Old Post Office, Burslem. September 16, Monday, Cherington, UK. The Cherington Arms. September 19, Thursday, Oxford, UK. Joe's Bar & Grill. September 20, Friday, Aylesbury, UK. Limelight Theatre. September 22, Sunday, Nottingham, UK. The Running Horse. Advance tickets available here! September 26, Thursday, Bristol. The Old Duke. February 1,Thursday, Phenix City AL. In-school blues education program as part of the Alabama State Council on the Arts Touring Artist Program. February 2, Friday, Seale AL. In-school blues education program as part of the Alabama State Council on the Arts Touring Artist Program. February 7, Wednesday, Millport AL. In-school blues education program as part of the Alabama State Council on the Arts Touring Artist Program. February 8, Thursday, Jemison AL. In-school blues education program as part of the Alabama State Council on the Arts Touring Artist Program. February 21, Wednesday, Greysville AL. In-school blues education program as part of the Alabama State Council on the Arts Touring Artist Program. February 24, Saturday, Tuscaloosa, AL. Debbie Bond Blues Band at the Band of Brothers Winter Music Festival. Music starts at 2pm, we're playing from 7 - 8pm. (205) 246 2569. February 26, Monday, Northport AL. Tommy Hych meet and greet from 6 - 8pm at Billy's Sports Grill in downtown Northport. Music with Debbie Bond and "Radiator" Rick from 7 - 8pm. February 27, Tuesday, Tuscaloosa AL. Workshop with the Alabama Blues Project advanced band. March 3, Saturday, Tuscaloosa AL. Debbie Bond and "Radiator" Rick benefit performance for Hospice of West Alabama celebrating their 9th Annual 5K run. Music outside the hospice from 7:30 to 10:30am. (205) 523 0101. March 6, Tuesday, Tuscaloosa AL. Workshop with the Alabama Blues Project advanced band. March 10, Saturday, Bessemer, AL. Debbie Bond Blues Band at the famous Gip's Place (directions here). Music from 8pm. (205) 919 8142. March 20, Tuesday, Tuscaloosa AL. Workshop with the Alabama Blues Project advanced band. March 24, Saturday, Mentone AL. Debbie Bond and "Radiator" Rick at the Mentone Arts & Cultural Center, next to the Plowshares Bistro. Music from 7 - 9pm. March 27, Tuesday, Tuscaloosa AL. Workshop with the Alabama Blues Project advanced band. March 30, Friday, Mobile AL. Debbie Bond and "Radiator" Rick at Mobile's excellent Listening Room - a great intimate venue featuring singer-songwriters and storytellers. Music from 8pm. April 3, Tuesday, Tuscaloosa AL. Workshop with the Alabama Blues Project advanced band. April 5, Thursday, Guntersville, AL. Debbie Bond and "Radiator" Rick at the Rock House Eatery. Music from 6-9pm. (256) 505 4699. April 7, Saturday, Birmingham, AL. Debbie Bond Blues Band at the Red Wolf Lounge. Music from 9pm. April 10, Tuesday, Tuscaloosa AL. Workshop with the Alabama Blues Project advanced band. April 13, Friday, Muscle Shoals, AL. Debbie Bond Blues Band at the excellent Champy's. Music from 7 - 10pm. April 17, Tuesday, Tuscaloosa AL. Workshop with the Alabama Blues Project advanced band. April 24, Tuesday, Tuscaloosa AL. Workshop with the Alabama Blues Project advanced band. April 28, Saturday, Bessemer AL. Debbie Bond Blues Band at the great 9th Annual Bob Sykes BBQ & Blues Festival! (205) 426 1400. May 1, Tuesday, Tuscaloosa AL. Workshop with the Alabama Blues Project advanced band. Thursday, May 3, 2018, Camden AL. In-school blues education program. May 4, Friday, Tuscaloosa, AL. Debbie Bond Blues Band at Tuscaloosa's newest brewery tap room, Band of Brothers. Music from 7-9:30pm. (205) 246 2569. May 8, Tuesday, Tuscaloosa AL. Workshop with the Alabama Blues Project advanced band. May 10, Thursday, Decatur, AL. Debbie Bond and "Radiator" Rick at the great Princess Theatrer. Music from 7pm. May 12, Saturday, Birmingham, AL. Debbie Bond and "Radiator" Rick at Pepper Place Market. Music from 8:30am. (205) 490 3176. May 13, Sunday, Birmingham AL. Great, intimate listening room - Debbie Bond Blues Band at Daniel Day Gallery/Dream Mecca Studio. Music from 2-6pm. (205) 731 7420. May 26, Saturday, Aliceville, AL. First Alicevillle Back Home Blues Festival at Cookieman's Place, featuring the Debbie Bond Blues Band, Blue Camp Band, Tekknology Band and Willie Lee Halbert and the Fingerprint Band. Gates open at noon, music from 3 - 9pm. Camping / RV available on site. 205 399 2567. June 26, Tuesday, London (Oxford Street). Debbie Bond and "Radiator" Rick at London's famous 100 Club. June 27, Wednesday, Sevenoaks, UK. Debbie Bond Blues Band performing at the Stag Community Arts Centre as part of the Sevenoaks Summer Festival. June 29, Friday, Lichfield, UK. Debbie Bond Blues Band at The Pokey Hole Blues Club. July 1, Sunday, Poynton, Cheshire, UK. Debbie Bond Blues Band at the great Bluefunk Rhythm and Blues Club. July 7, Saturday, Hook Norton, UK. Debbie Bond and "Radiator" Rick at Hook Norton's annual Music at the Crossroads festival. July 8, Sunday, Llandeilo, UK. Debbie Bond Blues Band at the excellent Jazz at Llandeilo festival. July 13, Friday, London, UK. Debbie Bond Blues Band at the most excellent St Harmonica's Blues Club. July 20, Friday, Luton, UK. Debbie Bond Blues Band at the Bear Club / Mill Yard Jazz and Blues. July 22, Sunday, Steventon, UK. Debbie Bond and "Radiator" Rick on the Apple Tree Stage at the excellent Truck Festival. July 23, Monday, Oxford, UK. Debbie Bond Blues Band at the Famous Monday Blues at the Jericho Tavern. July 24, Tuesday, Tunbridge Wells, UK. Debbie Bond and "Radiator" Rick at the Toad Rock Retreat. August 5, Sunday, Market Rasen, UK. Debbie Bond Blues Band at the Original Sunday Blues in the Hope Tavern. August 9, Thursday, Deal, Kent, UK. Debbie Bond Blues Band at Spooner's Blues Club in the The Alma. August 12, Sunday, Cannock, UK. Debbie Bond Blues Band at The Station. August 16, Thursday, Oxford, UK. Debbie Bond and "Radiator" Rick at the excellent Joe's Bar and Grill. September 14, Friday, Lavaré, FRANCE. Debbie Bond Blues Band at le Boucan des Arts. September 15, Saturday, Chatres sur Cher, FRANCE. Debbie Bond Blues Band at la Maison du Blues. September 16, Sunday, Clamecy, FRANCE. Debbie Bond Blues Band at Blues à Clamecy. 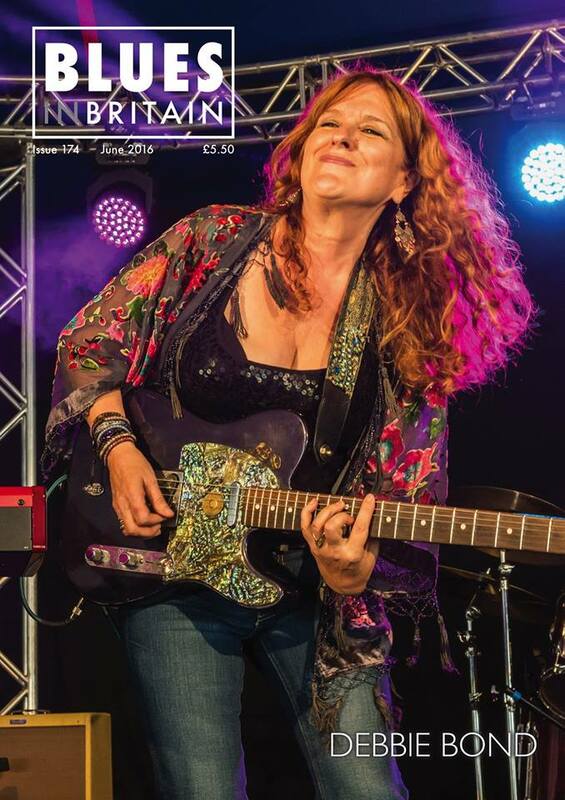 October 13, Saturday, Greenville, MS. Debbie Bond Blues Band at the excellent Mighty Mississippi Music Festival on the Highway 61 Blues Stage starting at 11:15am. October 20, Saturday, Bessemer, AL. Debbie Bond Blues Band at the famous Gip's Place (directions here). Music from 8pm. (205) 919 8142. November 9, Friday, Atlanta GA. Great blues venue - Debbie Bond Blues Band at the storied Northside Tavern. Music from 10pm-2am. (404) 874-8745. November 14, Wednesday, Perdido Key, FL. Playing the Frank Brown Songwriters' Festival at the Purple Parrot Tiki Bar. Music from 7:15pm to 8:15pm. (330) 853-6337. November 15, Thursday, Gulf Shores, FL. Playing the Frank Brown Songwriters' Festival at the Big Beach Brewing Company. Music from 8:30pm to 9:45pm. (251) 948-2337. November 16, Friday, Pensacola, FL. Playing the Frank Brown Songwriters' Festival at the Flora-Bama Dome Stage. Music from 6pm to 7pm. (850) 492-0611. November 24, Saturday, Birmingham, AL. Debbie Bond and "Radiator" Rick at Pepper Place Market. Music from 8:30am. (205) 490 3176. December 2, Sunday, Birmingham AL. Great, intimate listening room - Debbie Bond Blues Band at Daniel Day Gallery/Dream Mecca Studio. Music from 2-6pm. (205) 731 7420. December 8, Saturday, Birmingham, AL. Debbie Bond and "Radiator" Rick at Pepper Place Market. Music from 8:30am. (205) 490 3176. Wednesday, January 18, 2017, Pell City AL. Debbie Bond and "Radiator" Rick at the Pell City Public Library. Music from noon-1pm. Friday, January 20, 2017, Huntsville AL. Debbie Bond and "Radiator" Rick in the Kiln at AM Booth's Lumberyard. Music from 9pm. Tuesday, January 31, 2017, Tuscaloosa AL. Workshop with the Alabama Blues Project advanced band. Wednesday, February 1, 2017, Millport AL. In-school blues education program as part of the Alabama State Council on the Arts Touring Artist Program. Friday, February 10, 2017, Birmingham AL. Great, intimate listening room Moonlight on the Mountain with - opening with the great Rachel Edwards plus special guest Carla Don. Music from 7:30-10pm. Tuesday, February 14, 2017, Greensboro AL. Valentines day party with special guests Rachel Edwards and Carla Don at the Lake View Country Club (Millwood Road) - all welcome! Music from 6pm. (775) 530 4767. Thursday, February 16, 2017, Hayneville AL. In-school blues education program as part of the Alabama State Council on the Arts Touring Artist Program. Tuesday, February 21, 2017, Tuscaloosa AL. Workshop with the Alabama Blues Project advanced band. Wednesday, February 22, 2017, Rockford AL. In-school blues education program as part of the Alabama State Council on the Arts Touring Artist Program. Thursday, February 23, 2017, Fayette AL. In-school blues education program as part of the Alabama State Council on the Arts Touring Artist Program. Saturdayday, February 25, 2017, Columbus, MS. Debbie Bond and "Radiator" Rick at the Elbow Room. Music from 7-10pm. Tuesday, February 28, 2017, Tuscaloosa AL. Workshop with the Alabama Blues Project advanced band. Thursday, March 2, 2017, Tuscaloosa, AL. Debbie Bond and "Radiator" Rick at Tuscaloosa's first craft brewery, the Druid City Brewing Company. Music from 7-9pm. Friday, March 3, 2017, Muscle Shoals, AL. Debbie Bond and the TruDats with special guests Rachel Edwards and Carla Don, at Champy's. Music from 7-10pm. Tuesday, March 7, 2017, Tuscaloosa AL. Workshop with the Alabama Blues Project advanced band. Wednesday, March 8, 2017, Berry AL. In-school blues education program as part of the Alabama State Council on the Arts Touring Artist Program. Tuesday, March 21, 2017, Tuscaloosa AL. Workshop with the Alabama Blues Project advanced band. Wednesday, March 22, 2017, Tupelo, MS. Debbie Bond and "Radiator" Rick at the Blue Canoe. Music from 7:30-9pm. (662) 269 2642. Saturday, March 25, 2017, Tuscaloosa AL. Benefit performance for Hospice of West Alabama celebrating their 8th Annual 5K run. Music outside the hospice from 8:30am. (205) 523 0101. Tuesday, March 28, 2017, Tuscaloosa AL. Workshop with the Alabama Blues Project advanced band. Friday, March 31, 2017, Huntsville AL. Debbie Bond and "Radiator" Rick in the Kiln at AM Booth's Lumberyard. Music from 9pm. (256) 715 7130. Tuesday, April 4, 2017, Tuscaloosa AL. Workshop with the Alabama Blues Project advanced band. Thursday, April 6, 2017, Alabaster AL. Debbie Bond and "Radiator" Rick at Champy's. Music from 7-10pm. (205) 621-3991. Friday, April 7, 2017, Tuscumbia AL. Debbie Bond and "Radiator" Rick at the Rattlesnake Saloon. Music from 6:30-10pm. (256) 370-7220. Saturday, April 8, 2017, Birmingham, AL. Debbie Bond and "Radiator" Rick at Pepper Place Market. Music from 8:30am. (205) 490 3176. Tuesday, April 11, 2017, Tuscaloosa AL. Workshop with the Alabama Blues Project advanced band. Friday, April 14, 2017, Tuscaloosa, AL. Debbie Bond and band, featuring Rachel and Carla at Tuscaloosa's newest brewery tap room, Band of Brothers. Music from 7-9:30pm. (205) 246 2569. Saturday, April 15, 2017, Bessemer, AL. Debbie Bond and band, featuring Rachel Edwards, at the famous Gip's Place (directions here). Music from 8pm. (205) 919 8142. Tuesday, April 18, 2017, Tuscaloosa AL. Workshop with the Alabama Blues Project advanced band. Thursday, April 20, 2017, Guntersville, AL. Debbie Bond and "Radiator" Rick at the Rock House Eatery. Music from 6-9pm. (256) 505 4699. Tuesday, April 25, 2017, Tuscaloosa AL. Workshop with the Alabama Blues Project advanced band. Thursday, April 27, 2017, Tuscaloosa AL. Debbie Bond, "Radiator" Rick, Rachel Edwards and Carla Don at the excellent Loosa Brews. Music from 7-9:30pm. (205) 737 7440. Thursday, May 4, 2017, Hoover, AL. Debbie Bond and the TruDats at Hoover Public Library. Music from 6:30-8pm. Friday, May 5, 2017, Camden AL. In-school blues education program. Thursday, May 11, 2017, Tuscaloosa, AL. Debbie Bond and "Radiator" Rick at Tuscaloosa's first craft brewery, the Druid City Brewing Company. Music from 7-9pm. Sunday, May 14, 2017, Birmingham AL. Great, intimate listening room - Debbie Bond and the TruDats at Daniel Day Gallery/Dream Mecca Studio. Music from 2-6pm. (205) 731 7420. June 16, Friday, Worthenbury. Goin' Up The Country Blues and Roots Club. June 17, Saturday, Durham. Durham Blues Festival. June 18, Sunday, Cleethorpes. Cleethorpes Blues Festival. June 22, Thursday, Coalville. Hardtail Blues Club. June 24, Saturday, Billericay. Blues at Barleylands. June 26, Monday, Cherington. Cherington Arms. June 28, Wednesday, Sevenoaks. Performing at the Stag Community Arts Centre as part of the Sevenoaks Summer Festival. July 1, Saturday, London. Brooks Blues Bar at the Sound Lounge. July 4, Tuesday, Worthing. Worthing Pier. July 5, Wednesday, Bristol. The Old Duke. July 11,Tuesday, Hooley. Tuesday Night Music Club. July 14,Friday, Bridgend. Working Mens Hall, Blaengarw. July 15, Saturday, Marlborough.Marlborough International Jazz Festival. July 16, Sunday, Marlborough. Jazz gospel service. July 19,Wednesday, Northampton. The Malt Shovel. July 21, Friday, Upton. Upton Blues Festival. July 24, Monday, Oxford. Famous Monday Blues at the Jericho Tavern. July 28, Friday, Lichfield. The Pokey Hole Blues Club. July 30, Sunday, Gloucester. Gloucester Rhythm & Blues Festival. August 4, Friday, Luton. Bear Club / Mill Yard Jazz and Blues. August 6, Sunday, Bridgwater. Bar Brunel. August 10, Thursday, Cropredy. Cropredy Fringe Festival at the Brasenose Arms. August 11, Friday, Cropredy. Field 8 Bar and Kitchen. August 13, Sunday, Penrith. Lowther Folk Roots Festival. August 17, Thursday, Bristol. The Bristol Fringe. August 20, Sunday, Stevenage. Blues at the Red at the Red Lion. August 22, Tuesday, Tunbridge Wells. Toad Rock Retreat. August 24, Thursday, Tring. The Blues Bar Tring. August 27, Sunday, Market Rasen. Original Sunday Blues at the Hope Tavern. August 29, Tuesday, London (Oxford Street). The 100 Club. September 2, Saturday, Neydans, France. Come To Gather Fest. Friday, October 6, 2017, Huntsville, AL. Great outdoor location for the excellent, family-friendly "On the Dock" music series at Lowe Mill featuring Debbie Bond, Rachel Edwards and Carla Don. Music from 6pm. Tuesday, October 10, 2017, Tuscaloosa AL. Workshop with the Alabama Blues Project advanced band. Thursday, October 12, 2017, Northport, AL. In-school blues education program with the Alabama Blues Project. Friday, October 13, 2017, Northport, AL. In-school blues education program with the Alabama Blues Project. Friday, October 13, 2017, Birmingham AL. Great, intimate listening room Moonlight on the Mountain Debbie and "Radiator" Rick plus the great Rachel Edwards and Carla Don (aka AFROUnicorn). Music from 7:30-10pm. Tuesday, October 17, 2017, Tuscaloosa AL. Workshop with the Alabama Blues Project advanced band. Thursday, October 19, 2017, Guntersville, AL. Debbie Bond and "Radiator" Rick at the Rock House Eatery. Music from 6-9pm. (256) 505 4699. Saturday, October 21, 2017, Birmingham, AL. Debbie Bond and "Radiator" Rick at Pepper Place Market. Music from 8:30am. (205) 490 3176. Tuesday, October 24, 2017, Tuscaloosa AL. Workshop with the Alabama Blues Project advanced band. Thursday, October 26, 2017, Northport, AL. In-school blues education program with the Alabama Blues Project. Friday, October 27, 2017, Northport, AL. In-school blues education program with the Alabama Blues Project. Friday, October 27, 2017, Tuscaloosa, AL. Debbie Bond and band at Tuscaloosa's newest brewery tap room, Band of Brothers. Music from 7-9:30pm. (205) 246 2569. Thursday, November 2, 2017, Northport, AL. In-school blues education program with the Alabama Blues Project. Thursday, November 2, 2017, Northport, AL. Debbie Bond and "Radiator" Rick at Kentuck Art Night. Music from 5-8pm. Friday, November 3, 2017, Northport, AL. In-school blues education program with the Alabama Blues Project. Sunday, November 5, 2017, Tuscaloosa, AL. Debbie Bond and band at "Music Festival and Fundraiser for Emerge Alabama" hosted by Band of Brothers Brewing Company. Lots of great music starting at 3:30pm. We're doing a set with the great Carroline Shines around 7pm. Tuesday, November 7, 2017, Tuscaloosa AL. Workshop with the Alabama Blues Project advanced band. Thursday, November 9, 2017, Northport, AL. In-school blues education program with the Alabama Blues Project. Saturday, November 11, 2017, Birmingham, AL. Debbie Bond and band at Pepper Place Market. Music from 8:30am. (205) 490 3176. Sunday, November 12, 2017, Birmingham, AL. Debbie Bond and band at Jukin' For Jade, a benefit concert for Birmingham musician Todd Simpson's seriously ill sister, hosted at the last of the Alabama jukes, Gip's Place. Lots of great blues from 3pm to 8am. Tuesday, November 14, 2017, Tuscaloosa AL. Workshop with the Alabama Blues Project advanced band. Wednesday, November 15, 2017, Pell City, AL. Great lunchtime show with Debbie Bond and "Radiator" Rick at the Pell City Library. Music from noon to 1pm. (205) 884 1015. Sunday, November 19, 2017, Birmingham AL. Great, intimate listening room - Debbie Bond and the TruDats at Daniel Day Gallery/Dream Mecca Studio. Music from 2-6pm. (205) 731 7420. Tuesday, November 21, 2017, Tuscaloosa AL. Workshop with the Alabama Blues Project advanced band. Tuesday, November 28, 2017, Tuscaloosa AL. Workshop with the Alabama Blues Project advanced band. Saturday, December 2, 2017, Birmingham, AL. Debbie Bond and "Radiator" Rick at Pepper Place Market. Music from 8:30am. (205) 490 3176. Tuesday, December 5, 2017, Tuscaloosa AL. Workshop with the Alabama Blues Project advanced band. Tuesday, December 12, 2017, Tuscaloosa AL. Workshop with the Alabama Blues Project advanced band. A mouthpiece for sultry, Southern charm and whimsical musical conversation, Debbie Bond gets her heart tangled up in an intimate mess of backwoods Alabama soul. 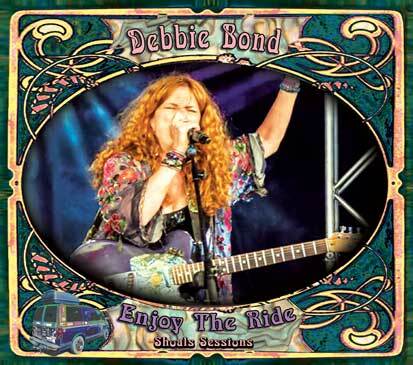 Debbie Bond has truly caught the essence of Southern Blues . . .
Alabama swamp . . . a true baptism into the blues! Debbie is a real find! Debbie is a star . . . I cant wait to see her again.